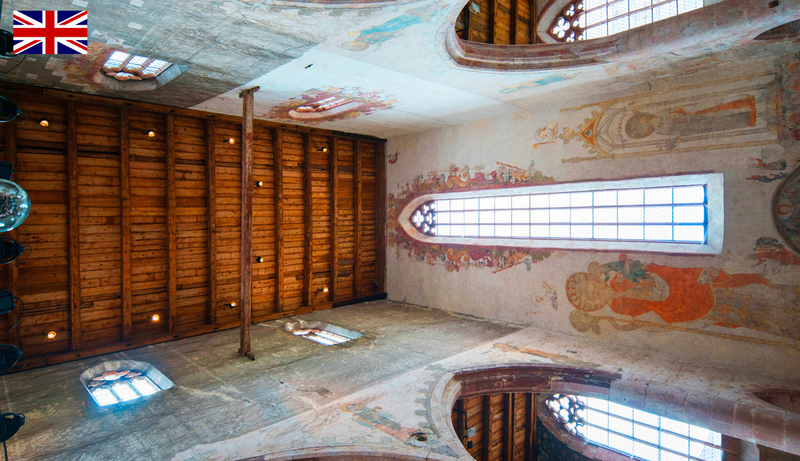 A former convent located in southern Alsace, at the crossroads between France, Switzerland and Germany, the “Dominicains de Haute-Alsace” Cultural Meeting Centre is now fully dedicated to music and the digital arts. The religious community moved out during the French Revolution. Since 1826, artists have been bringing the building to life. Unique artistic projects are produced in this remarkable architectural setting, with exceptional acoustics, dedicated to hosting and producing shows. The eclectic, unconventional programming goes from rock to baroque and from early music to contemporary music, at the snap of a finger. Each show is designed as a unique, immersive experience. Here, the unexpected, the transgressive and the subversive are cultivated and sought after. You can kick off your shoes and relax while you listen to classical music; get cosy in a hammock for a film screening in the cloister; lie down in the upper choir to listen, gazing up at the sky through the shapes cut out by the Gothic arches, with the musicians performing downstairs... Rewrite the rules, shake up your habits, open up your mind and open up to other people: that's what we are striving for. Because being bold also means taking a relaxed approach to the venue, the show and to culture in general. Welcome to the Dominicains de Haute-Alsace in Guebwiller, where the doors are wide open, so people can open their hearts and minds, too! Promoting culture and making it accessible to everyone is a key goal for the CCR. To help everyone feel at home, and because the difference can be seen in the minutest details, this process begins from the moment you arrive, with personalised assistance, in addition to adapted pricing. Once trust has been established, curiosity can take free rein, in a setting that favours interaction and creativity. The outreach programmes carried out at the Dominicains, whether for children or adults, all have the same objective: revealing and then sharing that little spark of creativity within everyone, which makes us all human. The Audiovisual Centre (CAV) is a laboratory for digital creation set up right at the heart of the Dominicains convent. In the shade of the cloister, under the pink sandstone arches, artists in residence have access to cutting-edge technical equipment. A setting conducive to creation. The Centre's productions are exported around the world. Timeless, thanks to its architecture, and at the forefront of technology, thanks to the facilities it offers, the convent offers artists in residence a unique space for creation, a peaceful haven that combines complete liberty with personalised support. The projects selected are the ones that boast both great freedom of tone and a strong desire to share with others. Because artists have a true social role to play. Artists in residence in this setting enjoy technical skills, support and trust, unfettered by any economic concerns. Not to mention having direct contact with their audience. A comprehensive approach, which makes the Dominicains de Haute-Alsace a genuine hub of culture. The convent exports its know-how by distributing its shows off the beaten track. This season the CCR is offering the following shows for distribution: “Les Ombres Errantes” (Wandering Shadows) explores how to perform classical music in the shadows. “Bille Holiday passionnément” a jazz piano chating with a nice movie about the black star . “Time" is fantastic marimba show . “Icebergs” is an installation encouraging viewers to think about melting ice and climate change.